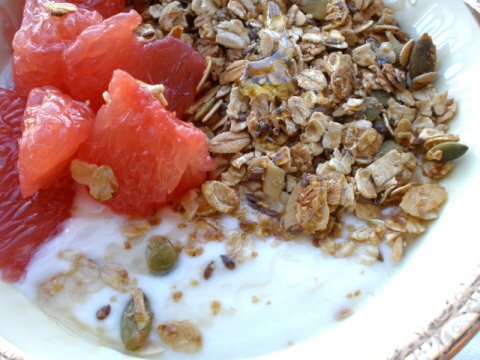 The simplicity of muesli lends itself to all sorts of customization, and experimentation. Note that there isn't any dried fruit in this recipe. You could certainly add dried fruit after the mix has cooled. Or, add fresh fruit to the top as shown here, or both! Spoon Nut n' Honey Muesli over yogurt, or add milk to serve. An extra drizzle of honey never hurt anyone either. Preheat oven to 275°. In a small sauce pan heat honey and vanilla extract over low heat. In a large mixing bowl combine; rolled oats, pumpkin seeds, almonds, flax seeds, and wheat bran. When honey has heated through add to oats. Mix thoroughly. Poor mixture evenly into a lipped baking sheet. Bake at 275° for 50-55 minutes, stirring about every 15 minutes. Allow to cool, then transfer to airtight container.